New point-and-shoot camera models are better every day. They can take awesome quality photos at large resolutions, so even beginners can be very proud of their portfolio. That’s great, but when you want to send your latest vacation photos over email, you wish they were smaller. Here are two free applications which will help you batch resize your photos without any hassle. Both programs work with 32-bit and 64-bit Windows 7 operating systems. The Image Resizer Powertoy was originally designed for Windows XP. This program is a clone that works with newer versions of Windows, Windows 7 included. As you can see from the above screenshot, the application is integrated with the Windows Explorer menu. After clicking “Resize Pictures”, you’ll be able to either choose one of the four preset sizes or input your custom size. 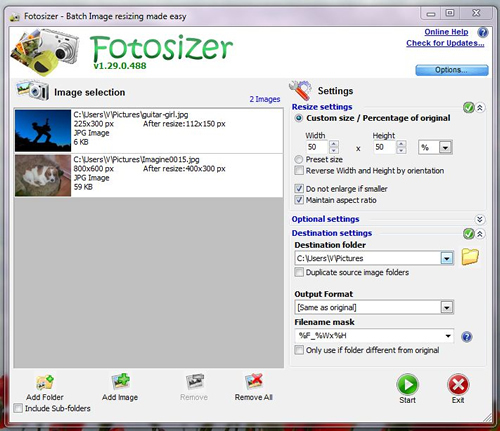 Small and easy to use, Fotosizer is a good choice if all you want to do with your photos is to resize them in order to make them good for email attachments, photo sharing websites or discussion forums posting. The software allows you to add images one by one, but, if needed, you can add a whole folder at once, with or without its subfolders. You can resize the photos either to specific height and width in pixels or by a percentage of the initial values. There are a few optional settings: picture rotation, black & white, sepia or negative. 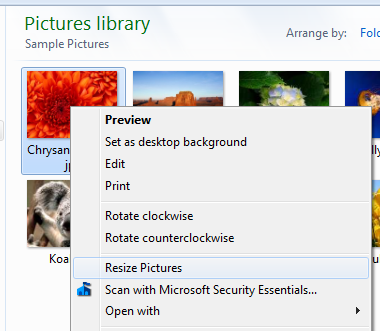 0 Respones to "Resizing Images In Windows 7 – Two Free Photo Resizer Apps wahwooo"